What Are Laser Etching Machines? Laser etching is the process of using a laser beam to cut an image or pattern into a hard material like glass, wood or metal. Most lasers can be adapted depending on the material being used and the level of heat required to make a permanent cut. Manufacturers tend to use two types of lasers to carry out the cutting process – hand-held lasers or machine-operated lenses. Technicians would typically use hand-held lasers to correct minor errors and resolve quality issues with a product. Artisans and engravers may also use hand-held lasers to make intricate engravings on a small surface area. Machine-operated lasers are better used for large-scale laser etching. If a company is mass-producing a specific pattern onto a material, they can create the design on the computer and then have it automatically control the lasers. Laser etching is commonly used for engraving metal and hard plastic materials. One of the main benefits of laser etching is the precision it offers. If you are looking to produce clean-cut edges and fine details, you can rely on laser etching machines to deliver the desired results. Laser etching machines are also faster than other similar pieces of technology. The fact they are so quick and relatively easy to use means that workers are able to carry out more jobs in a day, leading to higher levels of productivity and happy customers. The majority of laser etching machines are fairly straight forward to use. They tend to come with intuitive interfaces and many can also be linked up to computers so that all the user needs to do is create the design on screen and let the computer tell the laser what it needs to do. When purchasing a laser etching machine, you will need to consider the price and functionality. It’s important that the machine generates enough heat and has enough power to cut the material you will be using. Laser etching machines can vary in price, ranging from low to high, depending on their features and functionality. If you are only carrying out a few laser etching projects every now and then, you are not going to need as high quality and expensive machine as if you plan on using it multiple times a day. We also recommend choosing a laser etching machine with a user friendly design. If you won’t be using the laser etching equipment yourself, ask our staff to give their input on different machine types. That way you’re guaranteed to end up with a machine capable of meeting your needs. For quick and easy engravings in hard materials like glass, metal and plastic, there is no better method than laser etching. Not only is it ideal for carrying out mass engraving projects but also intricate details that require ultimate precision. If you are looking for a high quality laser etching machine for your business, have a browse of our laser marking systems. We have a number of different models for you to choose from, with something to suit all businesses’ needs. 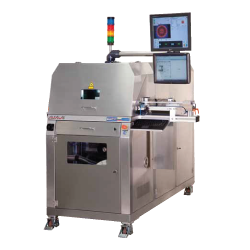 Whether you are new to laser etching or are looking for a professional quality machine, you can rely on our offerings to meet your needs in terms of both functionality and reliability. For more information, feel free to get in touch with the Tampo Print team.